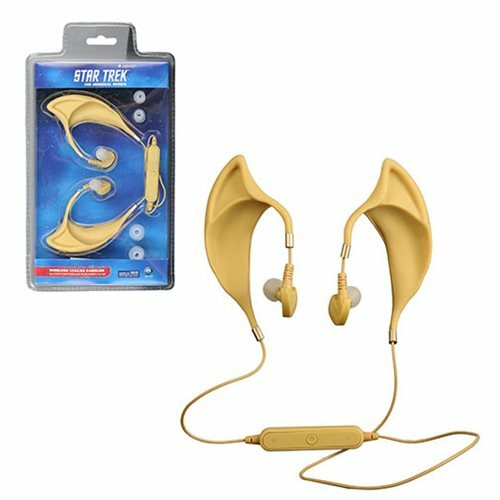 Rock like Spock in these Star Trek Vulcan Bluetooth Earbud Headphones, complete with pointed Vulcan ear tips! This functional accessory features a built-in microphone that allows you to handle both phone calls and media listening in style: accept and stop calls, as well as play, stop and skip between audio tracks! This style also commemorates the character of Spock, matching the pantone and color of the Vulcan skin-tone used for the makeup from Star Trek: The Original Series. It's only logical! Ages 4 and up. Flexible rubber ear tips for maximal comfort around ear! Choice of 3x ear bud sizes. In-line microphone and in-line remote. Wireless variant capable of syncing to your phone or other mobile device. Talk time: 4 to 5 hours. Color matched to Spock's unique Vulcan skin tone — exclusively available on this wireless version only!